Available from Laser Resources , the Rofin diffusion cooled series of slab lasers is used for cutting, welding and surface treatment, delivering versatility in application. 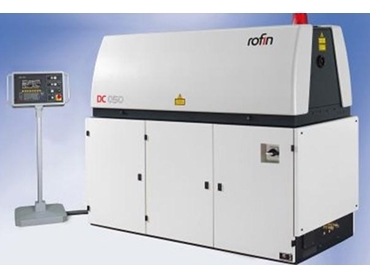 Available from 1kW to 8kW, the diffusion-cooled CO2 slab lasers from Rofin provide high reliability, operating with only a few extremely durable components without requiring conventional gas recirculation, leading to considerable reduction in maintenance and service. Gas consumption is also minimised while the integrated gas bottle eliminates the need for an external gas supply. The excellent beam quality of K=0.95 makes some of the fastest cuts and deepest weld seams. Its excellent attributes and high efficiency has made the Rofin slab laser a mainstream tool in countless production lines around the world.